Just beyond the tourist trap of Doi Suthep is another tourist trap catering to busloads of tourists…a Hmong village (Ban Doi Pui)….selling more of the same tourist crap. Okay, that’s not nice….it is beautiful and I regret not buying some of their beautiful embroidery, but they sell it everywhere in northern Thailand, so it loses some of it’s originality. I was starving and my blood sugar was plummeting so we stopped for a chance to stretch our legs, use the loo and grab a bite to eat. One of the women was serving up some piping hot Khao Soi (one of our favorite foods) with all of the goodies, so we stuffed ourselves silly and hopped back on the bike. 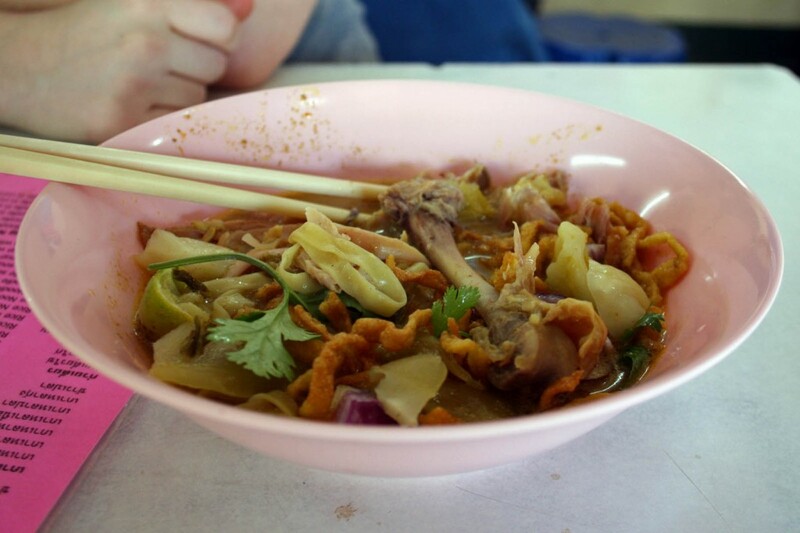 Delicious Khao Soi…probably should have taken a pic before I devoured the chicken…I was just so hungry!!! 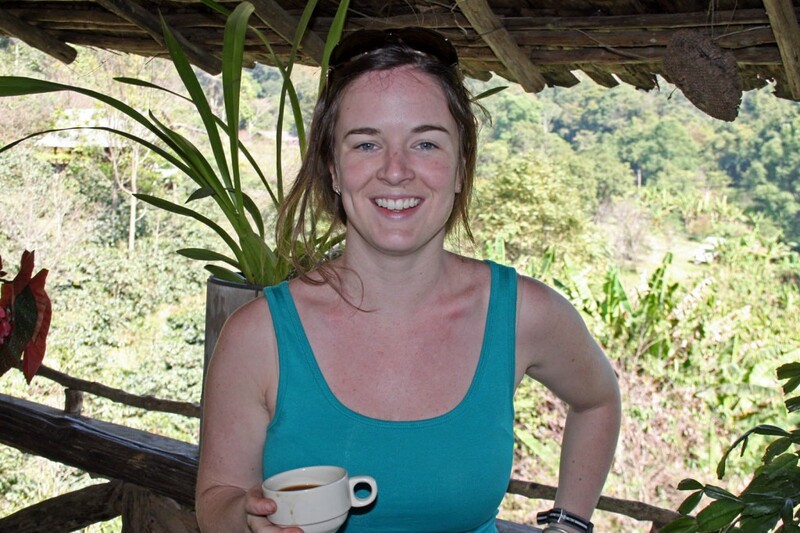 Me at the little cafe in the jungle enjoying a cup of super strong black coffee!!! 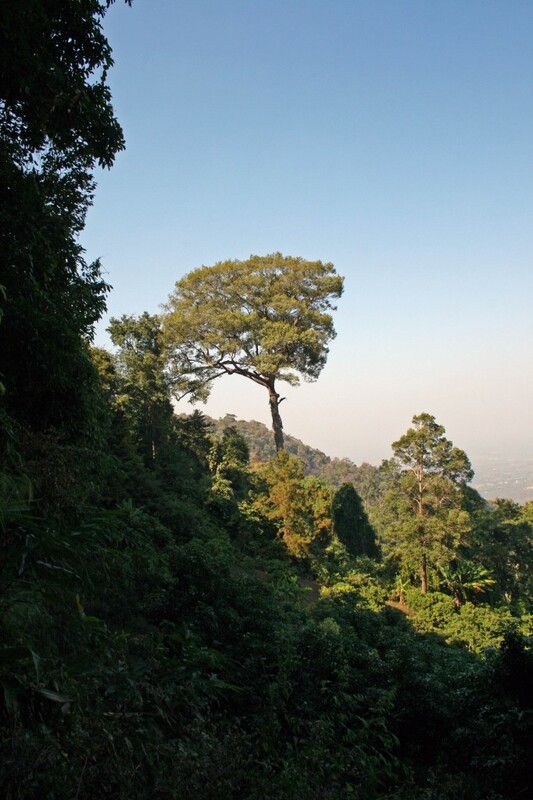 With a map in hand we headed out through the Doi Pui National Park and to the Chiang Mai University Coffee Farm. 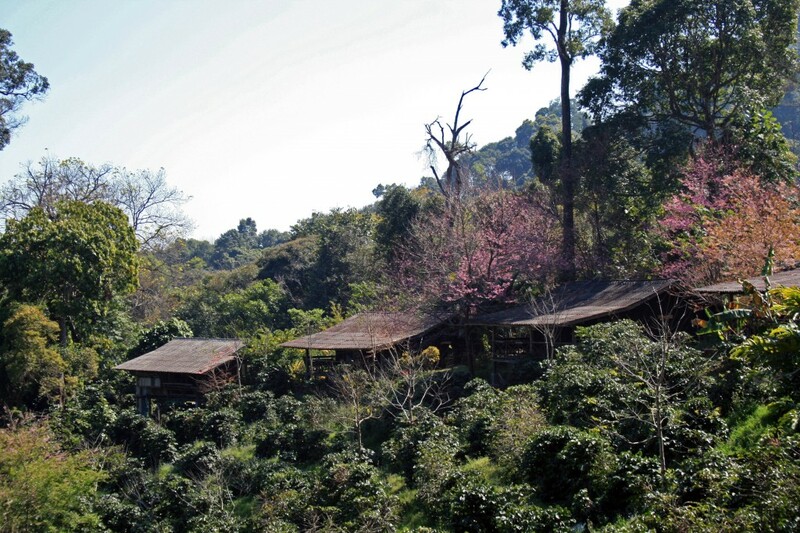 The farm and cafe are run by CMU students and local villagers and it overlooks a beautiful valley where it’s possible to enjoy a cup of coffee while you wander the grounds. Looks like spring!!! There were beautiful blossoming trees everywhere. 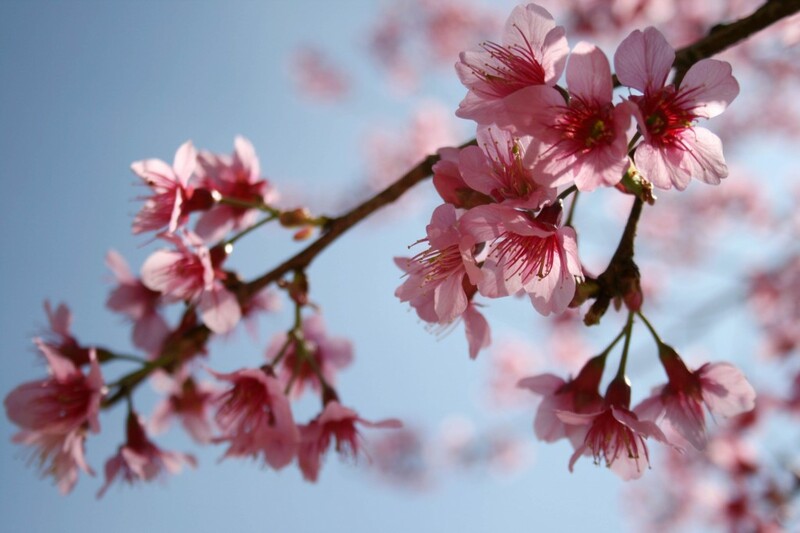 Apparently the trees blossom annually in December and January during the Thai winter. Cute little bungalows, unfortunately I think they are for students and not guests. 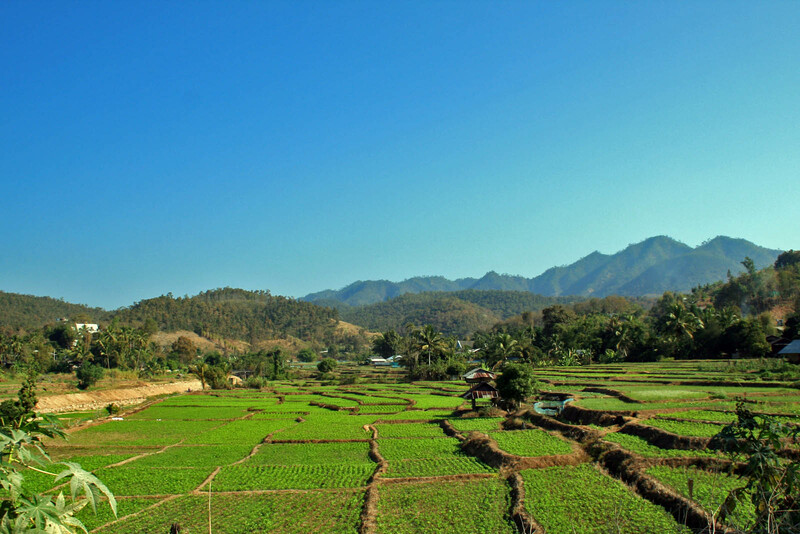 If I remember correctly there was another village (Baan Khun Chang Kian) not much further than the coffee farm. The “road” beyond the village deteriorated quickly and I don’t recommend it unless you have experience on rough, rocky roads. There were multiple times where I had to get off of the scooter while Steve half-rode half-walked the bike through rough patches. We did run into a couple of guys that were on big dirt bikes who said the route was popular among dirt bike “enthusiasts.” Unfortunately I had my camera put away for most of the crazy part and I only dug it out to take a picture of the view once. Steve on the little scooter that could. The road winds down the hill through groves of lychee (I think), but there wasn’t fruit on any of the trees to confirm. After a fun day of motoring around the countryside, that left my behind and back throbbing, we returned to our favorite Chiang Mai dive (Griffin Bar) for mojitos…. 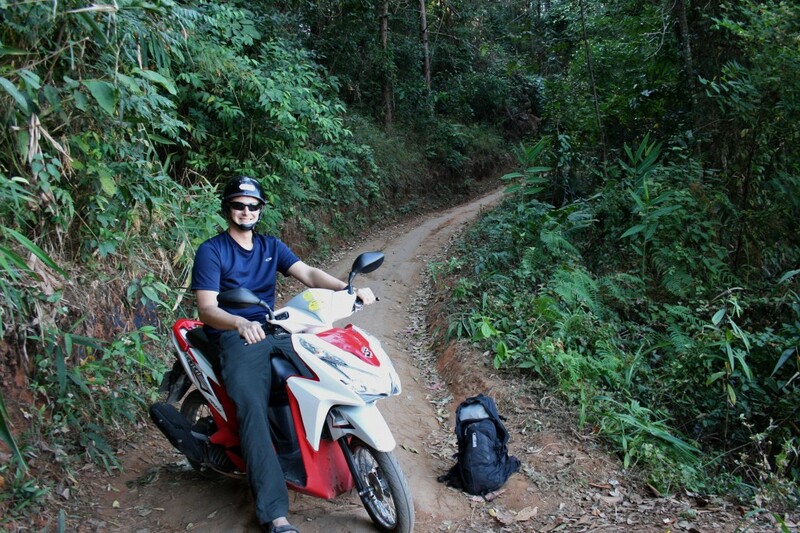 This entry was posted in Travel and tagged Ban Doi Pui, Chiang Mai, CMU coffee farm, coffee, Doi Pui, Hmong Village, Khao Soi, moto, Thailand by autumnadams4. Bookmark the permalink.